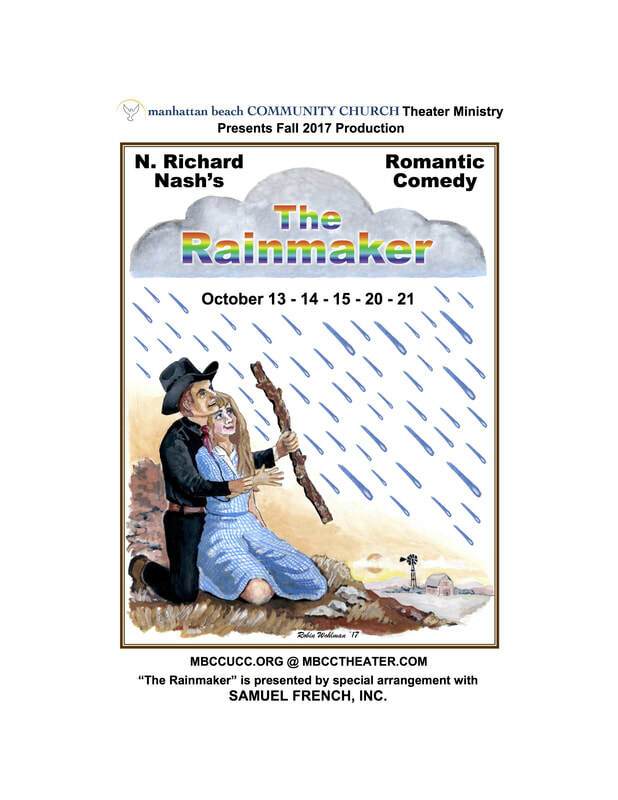 Welcome to MBCC Theater - we are an outreach program of the Manhattan Beach Community Church staging classic, contemporary and original plays in a fun and nurturing environment. enjoy our Season of fun and interesting events. The play was first seen in the West End in 1941, creating a new long-run record for non-musical British plays of 1,997 performances. It also did well on Broadway later that year, running for 657 performances. 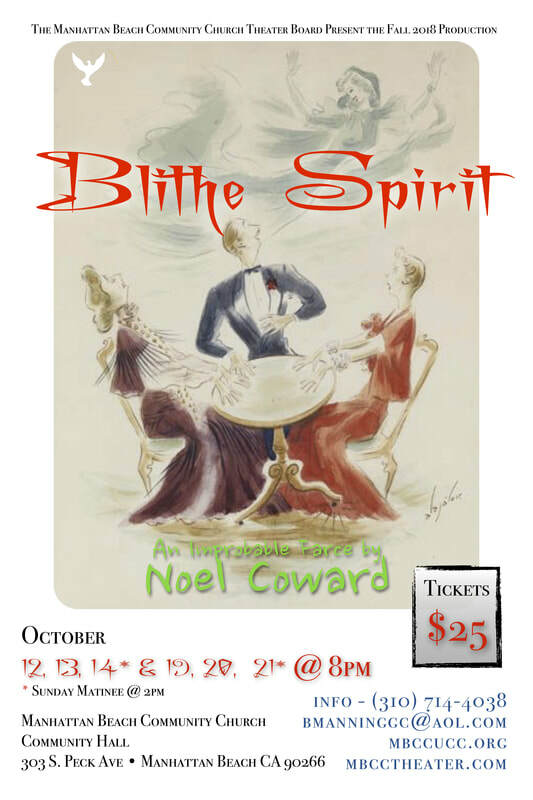 Coward adapted the play for film in 1945, starring Rex Harrison, and directed a musical adaptation, High Spirits, on Broadway in 1964. It was also adapted for television in the 1950s and 1960s and for radio. The play enjoyed several West End and Broadway revivals in the 1970s and 1980s and was revived again in London in 2004, 2011 and 2014. It returned to Broadway in February 2009. ​Bobby, a confirmed bachelor celebrating his 35th birthday, faces a series of separate events with five married couples who are his best friends and past three girlfriends that force him to contemplate his bachelorhood in the comedic Stephen Sondheim musical, “Company,” which opens at the Manhattan Beach Community Church Friday, March 24. Director Bob Manning said “Company,” which debuted on Broadway in 1970 and was nominated for 14 Tony Awards, is filled with challenging songs and choreography, which can be difficult for a non-professional group. “We wanted to do something that was a little more edgy … even though it's in the 70s, there's a lot of current day attitudes about relationships and it was still very current,” Manning said. 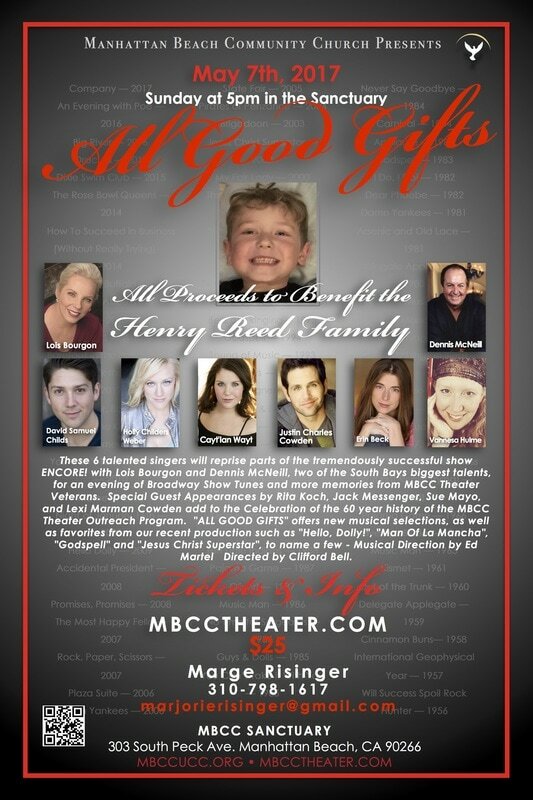 Even though “Company” has gone through small or major changes in different productions over the decades, Manning said MBCC is staying with the original book by George Furth. “I watched all the ones I could find … and try and pick what flavor I was interested in,” Manning said. Manning's first show with MBCC was “You Can't Take it With You” in 2010. His parents were stage actors so he grew up in theater. 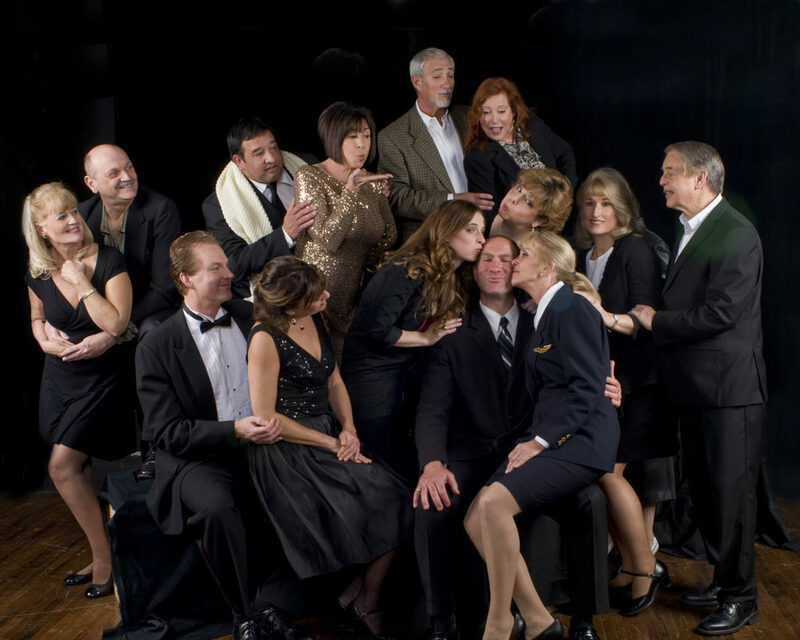 Manning said this cast has put in an extraordinary amount of time to make this production of "Company" work. He said even though rehearsals can get stressful, everyone is working hard. “You can tell people are giving their heart and soul ... that brings tears to my eyes,” Manning said. 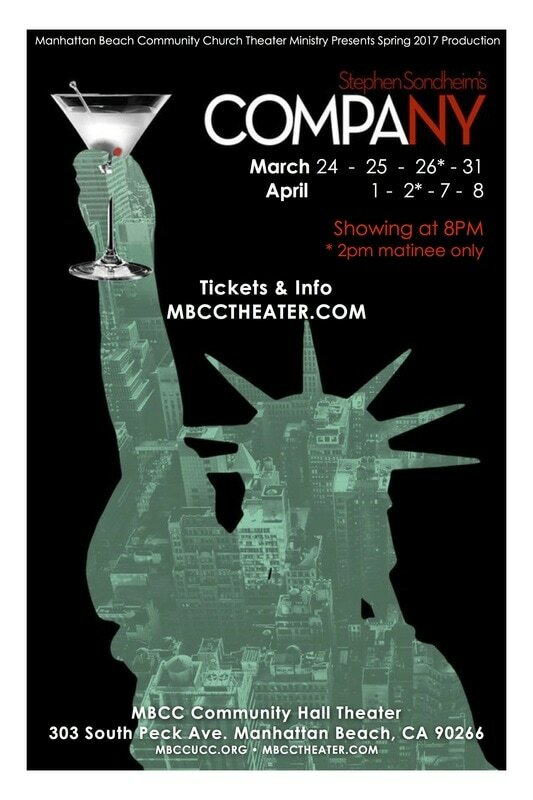 Performances of “Company” take place Friday, March 24, at 8 p.m.; Saturday, March 25, at 8 p.m.; Sunday March 26, at 2 p.m.; Friday, March 31, at 8 p.m.; Saturday, April 1, at 8 p.m.; Sunday, April 2, at 2 p.m.; Friday, April 7, at 8 p.m.; and closing night, Saturday, April 8, at 8 p.m. The MBCC is located at 303 S. Peck Ave.
For more information, visit mbcctheater.com. Musicals, by and large, are uplifting, and the ones performed under the auspices of your local church perhaps doubly so. 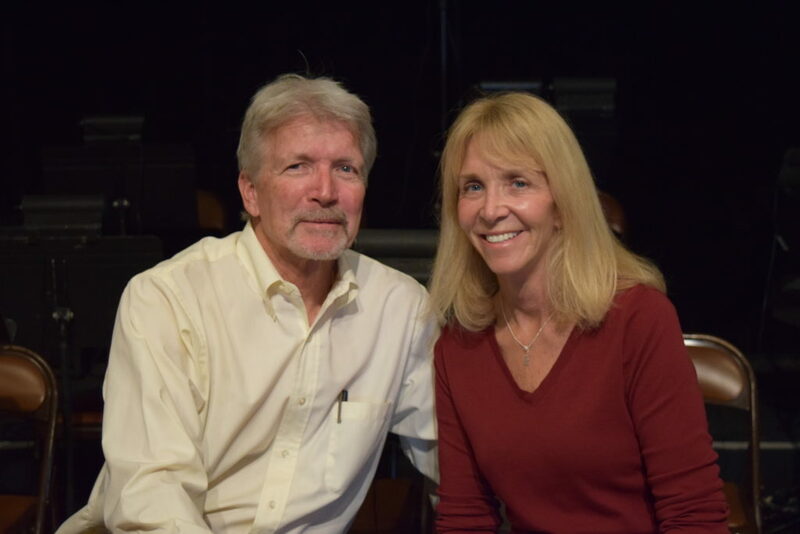 But sitting down with Bob Manning, who’s directing Stephen Sondheim’s “Company” for the Manhattan Beach Community Church Theater, it’s the word edgy, not the word uplifting, that comes up in conversation. “Company,” which premiered in 1970, is about a freewheeling bachelor named Robert, or Bobby, who is about to turn 35, and he’s thrown a surprise birthday party by his friends, who happen to be five married couples. All his friends married? Naturally he wonders whether he, too, should think of settling down. In other words, “Company” is a thoughtful, mature, and yet tensely graceful work, a must-see work, and it’s commendable for a church theater group to be staging it in the South Bay. 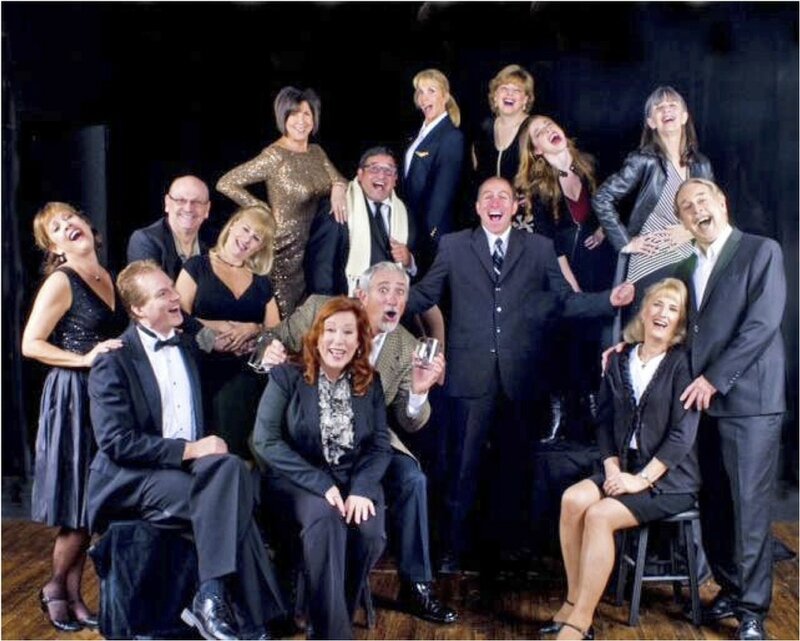 Bob Manning has been involved in local theater (the former Palos Verdes Players, etc.) for many years. He recently became president of the church’s theater board, which presumably helped when he pitched “Company” for their spring production. The board could easily have said no, and opted for lighter fare. So how did Manning succeed? “Definitely edgy,” Bailer Alfvin says. That’s to say there’s a minimum of props, black walls, flat floor, and for the first time that I can remember in this theater, an orchestra crammed together at the rear of the stage, a stage that isn’t so large to begin with. So what’s on stage? A piano on one side, a full bar on the other. The characters consume a lot of alcohol, and, as usual, alcohol can sometimes open verbal doors that might not otherwise be opened in public. The rehearsals started a while back, in January. 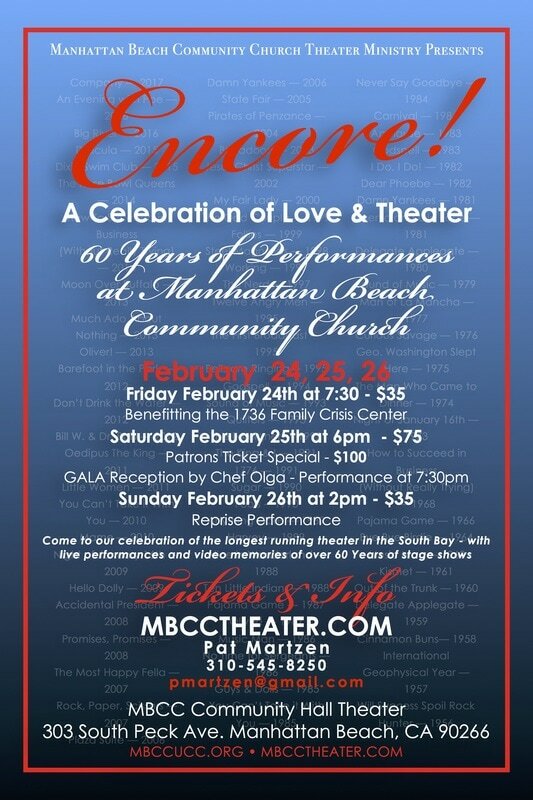 The cast in the shows at the Manhattan Beach Community Church Theater has usually been a mix of outside actors and people (some with little or no acting experience) associated with the church. Is that the case here as well? Manning is of the opinion that seeing a Broadway-caliber show can only be a good thing, because by the time a big show hits New York everyone has–as noted above–found the heart and soul and subtext of their character. Now, whether an actor does lots of research beforehand or not, everyone has to be on the same page when the curtain goes up. In this instance, Manning says, he gave his actors a pattern, one they’d start with and adapt as rehearsals continued and they got the lay of the land as it were, or in other words accommodated the action to the confines of the stage. For example, Manning wanted the music stands to be upfront, as you see with big bands. But then where would the cast be? So one compromises and makes adjustments until it feels right. 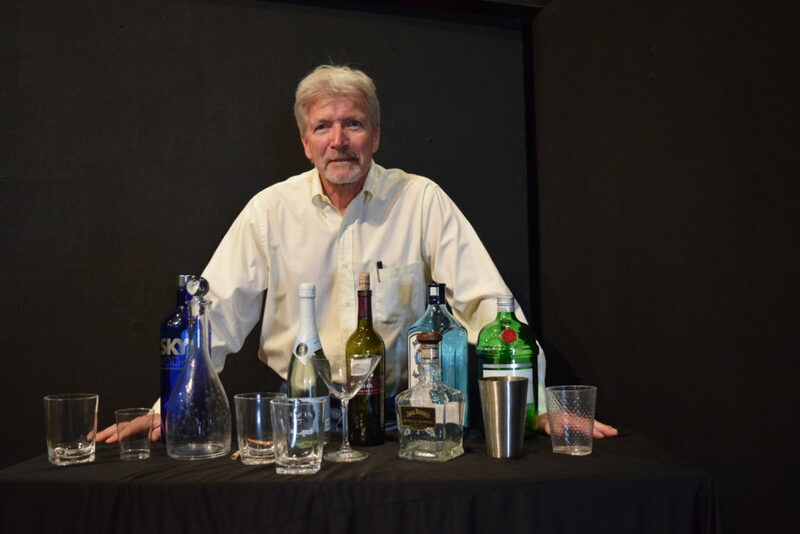 Manning hopes the theater will back away from too many community theater staples, “Arsenic and Old Lace” being an example of a play that’s so safe you can sanitize your hands with it before dinner. What’s unfortunate is that some theater companies, to appease their core or presumed core audiences, will opt for pablum over substance. At times it seems as if we can’t entrust adults with “adult” or mature-themed work. “If it’s in humor,” adds Bailer Alfvin. Besides, Manning says, it’s a Sondheim piece, a name-getter, and people want to see it. For that matter, Sondheim’s “Into the Woods” is about to open at the Ahmanson at the Music Center downtown. Directing “Company” is one thing, getting an actor to walk from here to there, and so on, but choreography is another matter altogether. Manning tried his hand at one of the opening numbers. “I had it down on paper, but trying to get it across to a bunch of cats is amazing.” He then praises Jeannine Barba and Larry Moreno, and remarks on how well they worked together in choreographing key scenes. And we’re not forgetting the vital element of music director David Boyer and his orchestra. I will do all I can to be worthy of Thee O Lord. It all has to do with it. Thank you God. Peace. There is none other. God is, It is so beautiful. Thank you God. God is all. Help us to resolve our fears and weaknesses. Thank you God. In You all things are possible. We know. God made us so. Keep your eye on God. God is. He always was. He always will be. No matter what…it is God. He is gracious and merciful. It is most important that I know Thee. Words, sounds, speech, men, memory, thoughts, fears and emotions – time – all related…all made from one…all made in one. Blessed be His name. Thought waves – heat waves – all vibrations – all paths lead to God. Thank you God. His way…it is so lovely…it is gracious. It is merciful – thank you God. His way…it is so lovely…it is gracious. It is merciful – thank you God. One thought can produce millions of vibrations and they all go back to God…everything does. Thank you God. Have no fear…believe…thank you God. The universe has many wonders. God is all. His way…it is so wonderful. Thoughts – deeds – vibrations, etc. They all go back to God and He cleanses all. He is gracious and merciful…thank you God. Glory to God…God is so alive. God is. God loves. May I be acceptable in Thy sight. We are all one in His grace. The fact that we do exist is acknowledgement of Thee of Lord. Thank you God. God will wash away all our tears…He always has…He always will. Seek Him everyday. In all ways seek God everyday. Let us sing all songs to God To whom all praise is due…praise God. No road is an easy one, but they all go back to God. With all we share God. It is all with God. It is all with Thee. Obey the Lord. Blessed is He. We are from one thing…the will of God…thank you God. I have seen God – I have seen ungodly – none can be greater – none can compare to God. Thank you God. He will remake us…He always has and He always will. It is true – blessed be His name – thank you God. God breathes through us so completely…so gently we hardly feel it…yet, it is our everything. Thank you God. All from God. Thank you God. In the final movement, Coltrane performs what he calls a "musical narration" (Lewis Porter describes it as a "wordless 'recitation'") of a devotional poem he included in the liner notes. That is, Coltrane "plays" the words of the poem on saxophone, but does not actually speak them. Some scholars have suggested that this performance is a homage to the sermons of African-American preachers. The poem (and, in his own way, Coltrane's solo) ends with the cry "Elation. Elegance. Exaltation. All from God. Thank you God. Amen." This biographical play highlights the career of one of Americas most beloved writers and delves into 'One Act Plays' of Poe's most famous works. Different individual directors helm each of these vignette's based on the authors best known writings - including: The Raven, The Tell Tale Heart, and the Pit and the Pendulum. 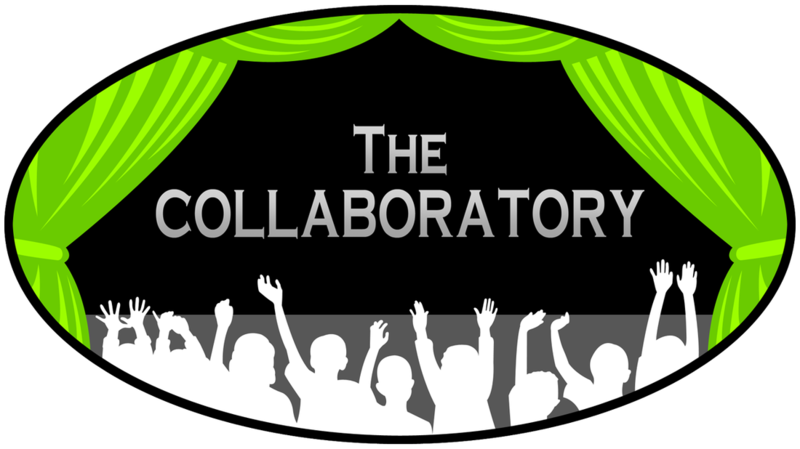 Holiday Charity Show with The COLLABORATORY! 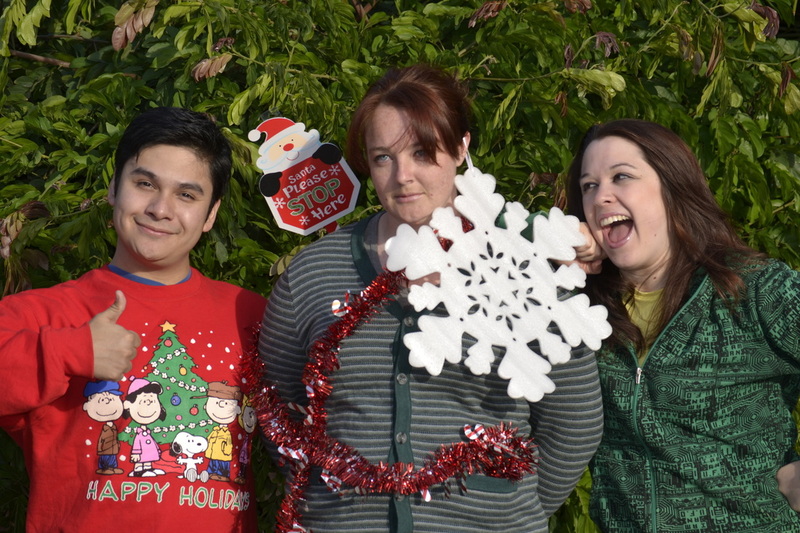 ​o celebrate the holidays, The Collaboratory would like to invite you to a special performance of their original family show, Unexpected Holiday. In this interactive hour long performance, we follow George and his niece Bailey, twelve days away from Christmas Eve wanting very different things. With the help of George's neighbors, they learn to let go of expectations and reconcile their differences, discovering that the most important part of the holidays is being together. In lieu of an admission fee, please bring a used men's coat. We are partnering with the Manhattan Beach Community Church Theatre to collect used men's coats for Infinite Ways Foundation. The coats will be distributed along with hot meals and toiletries to those living on the streets of LA on Christmas morning. The performance will be held in the Community Hall of the Manhattan Beach Community church at 7pm on Saturday, December 19th. Lucy Seward, whose father is the doctor in charge of an English sanitorium, has been attacked by some mysterious illness. Dr. Van Helsing, a specialist, believes that the girl is the victim of a vampire, a sort of ghost that goes about at night sucking blood from its victims. The vampire is at last found to be a certain Count Dracula, whose ghost is at last laid to rest in a striking and novel manner. 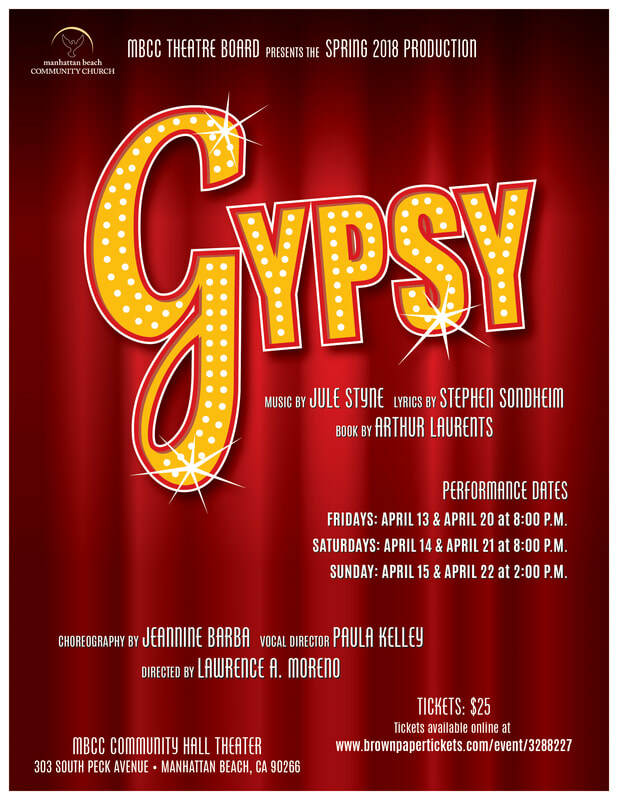 The play is intended for all who love thrills in the theater, and is appropriate for all groups. Dracula was first presented on Broadway by Horace Liveright at the Fulton Theatre in New York City on October 5, 1927. It was directed by Ira Hards.